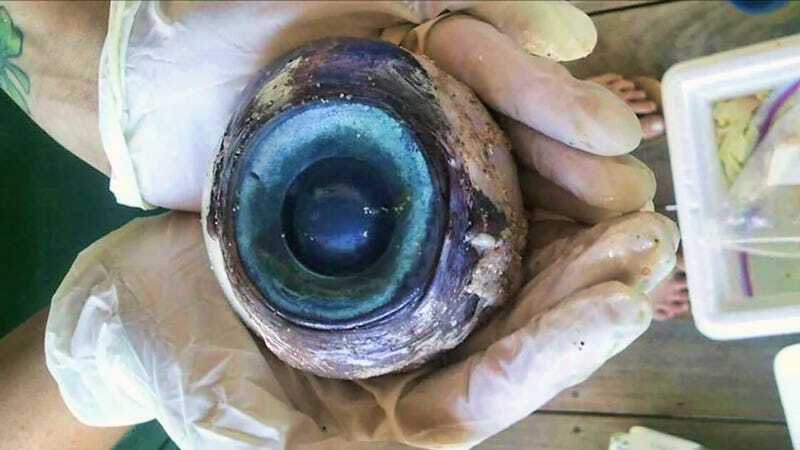 Yesterday, Gino Covacci was walking peacefully by the sea when he found this: a gigantic, monstrous eye still oozing blood. Scientists haven't identified the leviathan who lost it yet. Was it a giant squid, a whale, or the eye from a titanic monster born mutant because of nuclear tests? Talking to the Sun Sentinel, the Pompano Beach, Florida resident said the eye "was very, very fresh. It was still bleeding when I put it in the plastic bag." Covacci contacted the police first, and then the Florida Fish and Wildlife Conservation Commission. Officials from the latter have put the eye in a formaldehyde and water solution, sending it to the Florida Fish and Wildlife Research Institute in St. Petersburg. A spokeswoman said that "right now it sounds like a large fish is the leading candidate." No kidding.